In college football FBS, there are currently 20 head coaches, who are coaching at their alma maters. Lucky them! But what if every school was led by an alum? Currently the New England Patriots Defensive Coordinator. Flores has been on the Patriots staff in some form since 2004, obviously has no head coaching experience (yet, he’s on NFL short lists. Saints Offensive Coordinator Pete Carmichael is another BC grad. Former Vanderbilt head coach from 2002-2009. Out of coaching since. Recently fired East Carolina head coach, comes home where he was Duke’s QB (1996-1999) and Offensive Coordinator (2014-2015). Had been at Colorado head coach since 2013 and former GT defensive back in 1987-1988. Ken Whisenhunt, current LA Chargers Offensive Coordinator is also a GT grad and was oddly mentioned for this real life opening. Previously, we had Rick Stockstill here, the long-tenured current coach at Middle Tennessee State, where he has been since 2006. Stockstill played QB at FSU from 1977-1981. Instead, we will give Manny Diaz a shot here, a former Miami (and long time) Defensive Coordinator, who was recently hired by Temple. This seemed like a real possibility to happen in real life, but Brohm ultimately agreed to stay at Purdue. Brohm is a former Louisville QB and assistant coach and is currently the head coach at Purdue since 2017, previously was at Western Kentucky. Richt played QB for “the U” from 1979-1983 and after a long stint at Georgia (2001-2015) finally came back home in 2016. Another option here is Mario Cristobol, who played OL from 1989-1992 and is current Oregon head coach. Most recently Indiana head coach and current Ohio State co-Offensive Coordinator. Current Iowa State head coach and previously had success as Toledo coach. He spent one year at Pittsburgh in 1998 as a defensive lineman. Current UConn head coach and former UConn head coach. Edsall coached UConn from 1999-2010 before leaving for Maryland after winning the Big East. He’s back now. Current Jacksonville Jaguars head coach Doug Marrone is a Syracuse grad, who coached the Orange from 2009-2012, before bolting to the NFL. Former Arizona Cardinals head coach, whose only college experience came from 1983-1988 at Temple. This would actually be a good real life hire for Indiana. Carey is 49-27 at Northern Illinois, where he has been since 2012. He played center for Indiana 1990-1993. Another option is Maryland interim coach and long time Offensive Coordinator, Matt Canada. Reich is the current Indianapolis Colts head coach and doesn’t have college experience. He did appear in a Super Bowl with the Buffalo Bills and played QB for the Terps, as a backup to Boomer Esiason, before becoming the starter in 1984. After a successful stint at Stanford and a nice run in the NFL with the San Francisco 49ers (where he led SF to a Super Bowl appearance in 2012, he has been at his alama mater since 2015. Take your pick of current NFL head coaches, both of whom are under fire for their team’s subpar performances in 2018. Dungy is long retired, but for fun we included Bill Cowher at NC State earlier, so thought it was appropriate to list Dungy too. Dungy is a 2x Super Bowl champion and has no college coaching experience. After a 12-0 season in 2017, Frost left UCF to come home to his alma mater. Frost helped Nebraska go 13-0 and win the National Championship as a QB in 1997. His Nebraska tenure has gotten off to a rough start but he will be given enough time and resources to fix things in Lincoln. Fitzgerald played Linebacker for Northwestern from 1993-1996 and has been the Wildcats head coach since 2006. Another option here is Titans head coach Mike Vrabel, but Fickell has active college head coaching experience and a lengthier resume (due to Vrabel having a long pro career). Fickell was a star linebacker (along with Vrabel) from 1993-1996 and from 2002-2016 was on the Ohio State coaching staff. 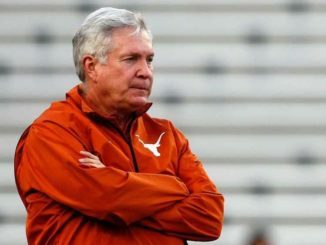 He was interim head coach in 2011, before returning to Defensive Coordinator. He is currently the head coach at Cincinnati. Current Baylor head coach and former Temple coach. Penn State is nicknamed “Linebacker U” and Rhule fits that name perfectly as a LB from 1994-1997. In this scenario, Rhule would have former Miami head coach Al Golden on his coaching staff. Chryst is a former Wisconsin quarterback and was Offensive Coordinator/QB coach from 2006-2011. He coached at Pittsburgh for a few years before his alma mater came calling in 2014. Mel Tucker, former Georgia DC who was recently hired by Colorado, is also a former UW grad. Current Arkansas State head coach, who played at Baylor from 1987-1989. Current head coach at UCF, previously played QB for Oklahoma from 1999-2000. He was the Sooners OC from 2011-2014 before being fired. Current Virginia Tech head coach Justin Fuente started 5 games at QB for Oklahoma, before transferring. Heupel’s longer stay at OU and 12-0 record in 2018, gives him the nod. Gundy has been head coach at his alma mater since 2005 and was a QB for the Cowboys in the late ’80s. Morriss was the head coach at Kentucky from 2001-2002 and Baylor from 2003-2007. He is still actively coaching, as the Offensive Line coach at Lexington Christian Academy in Kentucky. Ironically, Applewhite replaced current Texas head coach Tom Herman at Houston, where he has been head coach since 2017. He played QB at Texas from 1998-2001 and was an assistant coach there from 2008-2013. Previously, we listed Kliff Kingsbury here, but with his recent firing, it opens the door for Tech to hire one of the top young coaches in football. All Riley has done since taking over Oklahoma as head coach in 2017 is lead the Sooners to back-to-back Playoff appearances and produce back-to-back Heisman Trophy winning QBs. That’s all, no big deal. could have gone with Rich Rodriguez, but been there, done that in Morgantown. Holiday, who coaches down the street at Marshall steps in and takes over. Not many options for Arizona, but Pierce, a former Super Bowl champion with the NY Giants is the current Arizona State LB Coach. Rivera has no college coaching experience and is currently Carolina Panthers head coach. He was an All-American linebacker for Cal in the 80s and was a part of the Chicago Bears 1985 Super Bowl team. Gibbs has no head coaching experience but is currently the Texas Tech Defense Coordinator and deserves credit for turning a unit that used to be a disaster. Another coach with no head coaching experiences that qualifies is Eric Bienemy, the KC Chiefs RB Coach. Mendenhall was a Beavers assistant in 1995-1996 and is current Virginia’s head coach and previously spent 11 years as BYU head coach until 2015. Shaw is 78-25 at Stanford, currently in his 8th season as Cardinal head coach. He is a 4x Pac-12 Coach of the Year and 3x Pac-12 Champion. Norton has no head coaching experience and his college experience includes being Linebackers coach at USC from 2004-2009. He has been an NFL Defensive Coordinator since, currently with the Seattle Seahawks. He won 3 Super Bowls as a player and was a 2nd round draft pick in 1988 by the Dallas Cowboys. Del Rio was a USC linebacker in the early 80s and has oddly always been mentioned as an option every time the USC job comes open. All of his coaching experience has been in the NFL, coaching the Jaguars from 2003-2011 and the Raiders from 2015-2017). Former Oregon State and Wisconsin head coach. Was recently re-hired as Utah State head coach, where he spent time from 2009-2012. Mora played Defensive Back in the early 80s, he has experience coaching in Washington, with the Seattle Seahawks in 2009. He coached the Atlanta Falcons before that and most recently was the head coach at UCLA. He has previously referred to coaching Washington as his “dream job”. I’m not sure sure the fanbase would reciprocate that kind of love to Mora. Swinney is Clemson’s current head coach and won the National Championship in 2016, beating Alabama. 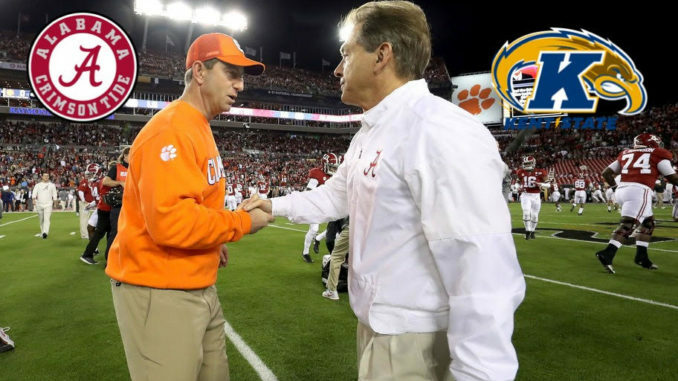 If anyone could replace Nick Saban it’s probably Swinney, a former WR for the Tide. This is a real rumor that will only grow stronger and stronger as we get closer to Saban’s retirement, probably 40-50 years from now. Worth noting Duke head coach David Cutcliffe is also an Alabama grad. This would certainly make Auburn fans happy right now. The only reason Malzahn signed a 7 year, $49 million extension before this season is because Arkansas made him a similar offer and the Tigers wanted to make sure they kept him. Malzahn has been at Auburn since 2013, after spending one year at Arkansas State. Another alum is Butch Davis, currently at FIU, 2x Super Bowl champion and coached Miami to a National title game appearance. Former Houston head coach (2011-2014) and Purdue assistant coach. Currently out of coaching, Chizik was most recently UNC’s Defensive Coordinator in 2016. He was previously head coach at Iowa State and Auburn, where he won the National title in 2010. Brian Schottenheimer is a long time NFL Offensive Coordinator, with no head coaching experience, and is also a Florida alum. Smart is one of those lucky coaches already at his alma mater. He was a DB at Georgia from 1995-1998 and was the Alabama Defensive Coordinator from 2008-2015, before getting the Georgia job. Other Georgia coaches could include Colorado State head coach Mike Bobo and South Carolina head coach Will Muschamp. Brown started his career at Kentucky before transferring to UMass. Kentucky assistant from 2013-14 and has been head coach at Troy since, compiling a 31-15 record. Odom replaced legendary Gary Pinkell and has been head coach of the Tigers since 2016. Another choice here is Jim Leavitt. Leavitt played Safety at Missouri in the mid ’70s and was the head coach at USF from 1997-2009. He has been the Defensive Coordinator at Oregon since 2016. Luke is a former Ole Miss Center who was promoted to interim and later full-time head coach in 2017, following controversy involving outgoing coach Hugh Freeze. Southern Miss head coach Jay Hopson was a defensive back for the Rebels from 1988-1991. Successful run as Michigan State’s head coach since 2007. Tee Martin is a legend in Knoxville. As a QB in 1998, he helped lead the Vols to a 13-0 season and BCS National Championship. He has been USC’s Offensive Coordinator since 2015. Another active Offensive Coordinator is Jim Bob Cooter with the Detroit Lions. Current Arkansas head coach and previously SMU head coach. Also got his big break as Clemson’s Offensive Coordinator. Former Texas head coach, current ESPN analyst. Attended Vandy from 1969-1970 before transferring to FSU. Had 82 rushing attempts for 364 yards and 1 touchdown. Current Broncos QB coach is a 1989 US Military graduate. He has extensive NFL coaching experience as an Offensive Coordinator and QB coach. Not the most inspiring hire. Holtz is current head coach at Louisiana Tech, since 2013 and previously coached USF and ECU. He is the son of former ND coach Lou Holtz, who coached the Irish from 1986-1996. Currently coaching his alma mater since 2016. Mike Leach is also a BYU grad as is Utah coach Kyle Whittingham. Former ECU head coach (2010-2015) and current Oklahoma Defensive Coordinator. ECU fans would surely welcome a reunion. Current USC head coach. Helton was Houston’s QB from 1993-1994. He has been on USC’s coaching staff since 2010 and the head coach since 2016. Butler is currently the Pittsburgh Steelers Defensive Coordinator and attended Memphis State in the ’70s. From 1990-1997 he worked on the Memphis staff as an assistant coach. Current Texas Offensive Coordinator with no head coaching experience. Previously was OC at Nebraska and Ohio State. Current Iowa head coach, since 1999. Has been coaching at his alma mater since 2007. Has been head coach at Boise State since 2014, after a one year stint at Arkansas State. Played QB from 1995-1999 for the Broncos. We’ll stick with the incumbent coach, who has had a successful two years at his alma mater, after a lengthy 11 year run at Cal. Fresno State was 1-11 the year before Tedford’s arrival and just completed a 12-2 campaign. Worth noting, FAU head coach Lane Kiffin played QB at Fresno State from 1994-1996. Rolovich has been the head coach on the islands since 2016. In 2001, he quarterbacked Hawaii to an 8-1 record as a starter, replacing the famous Timmy Chang. Other options include Ken Nuematolo, who has had a great run as Navy head coach since 2007. He has been offered the Hawaii job several times but has repeatedly turned it down. Current Syracuse head coach Dino Babers is also a Hawaii alum, playing both RB and DB in the early ’80s. Current head coach at San Diego State, since 2011. Long coached his alma mater from 1998-2008, compiling a 65-69 record and a 1-4 bowl record in that time. Wells recently departed USU for Texas Tech. But he had coached at his alma mater from 2013-2018 and played QB from 1993-1996. Current Arizona State head coach, in his first season working in the college game. He played his senior season at SDSU in 1975. Former NFL first round pick and current Offensive Coordinator with the Arizona Cardinals. It’s only a matter of time before the quick rising former QB ascends to a top role. Bell was Florida State’s Offensive Coordinator in 2018 and was just hired by UMass to be their new coach moving forward. Current NY Jets Offensive Coordinator played college ball at Rice from 1996-1999 and has been an NFL assistant since 2002. Freeze was most recently Ole Miss head coach and was fired before the 2017 season because of controversy around him and the program. He was hired by Liberty this off-season as their new head coach. Been there, done that. Taggert coached WKU from 2010-2012 and went just 16-20, before moving on to South Florida, than Oregon for one year, and now at Florida State. Long time NFL Defensive Coordinator Romeo Crennel (currently with Texans) is also a WKU grad. Current Titans Defensive Coordinator and long time DC with the Ravens. Pees has been coaching since 1979. He was head coach at Kent State from 1998-2003. Bonamego was coaching CMU from 2015-2018, but was fired this off-season, after a 1-11 season. He was 22-29 overall in four years. This is the biggest winner by a long shot on this list. Saban played defensive back from 1970-1972 at Kent State and from 1973-1976 was an assistant coach there. The rest of his resume is pretty well documented – he coached at Toledo for one year, Michigan State, LSU, and the Miami Dolphins and has been at Alabama since 2007. Another option is Ravens coach John Harbaugh, but clearly Rams coach Sean McVay would be an over the moon phenomenal move that elevates the Redhawks program. Fleck was recently at Western Michigan, where he helped lead the Broncos to a perfect regular season in 2016. He has been at Minnesota ever since. Currently coaching his alma mater, hired in 2017. Played WR from 1996-1999. He has been head coach of his alma mater since 2013, and recently left to accept the job at Louisville. Another App State alum is long time Georgia Tech head coach Paul Johnson, who recently announced his retirement.